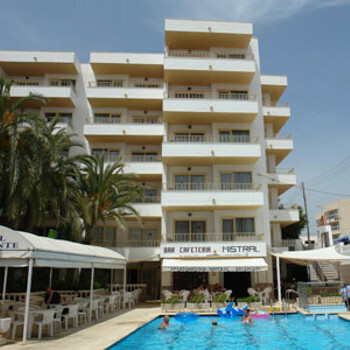 The Mistral Apartments in Playa Den Bossa, Ibiza, are a 1 star complex with swimming pool, shop and laundry facilities. Oh where do I start!!! Arrived there at 1pm and were told that the room would'nt be ready for another 3 hours, so went off for a few drinks and came back, when we got up to the room it definitley did'nt look like 3 hours of cleaning went into it, more like 3 minutes. Later on in the evening the first of our many unexpected "guests" started arriving...cockroaches!!!! overall I'd say about 15 roaches lost there lives during our 1 week stay. Kitchen area was dirty. Pool had cockroaches in it!!!! Staff would quite obviously ignore you if they saw you coming. Dreadfull hotel, would never stay here again!! Go for the Jabeque across the road, that was a proper hotel.